Viewing topic "FC7 pedal in song mode and master mode with midi controller"
I have the midi keyboard Novation Impulse 61 connected with midi cable from Novations’s midi out to Motif XF6’s midi in. I use it in song mode. I have few separate tracks (mixvoices) set to motif’s channel 1, and they are with custom note shifts so they do not mix, so i have few separate sounds to control on motif’s keyboard. As for the other tracks i layered two voices on channel 2, layered two voices on channel 3 and layered two voices on channel 4. Novation impulse can use assignable templates to transmit on up to 4 different midi channels at the same time, so im controlling motif’s channels 2, 3 and 4 with it. Ok so my problem is, i want to use FC7 pedal to control volume of every channel at the same time. How can i do this? Right now it only controls the volume of track that is selected with a button on motif (in this case track/channel 1). But i need it to control volume of everything that i play whatever channel it is on. I know that i can buy a normal volume pedal so it directly alters the output signal but i would like if it worked with FC7. I thought about putting every voice on channel 1 and use note shift settings on motif (and octave settings on novation), and maybe i could have them all (volume) controllable at the same time with FC7 but it is a too complicated solution because i need this to work for more than one song. Is it possible to make song associated master program where i have 8 internal motif’s voices (or more voices stacked few of them on every midi channel) set to 8 master zones, where i would control 4 of those on motifs keyboard and the other 4 with my midi controller’s keyboard, while setting every of the 8 Motif’s sliders to control every zone’s volume? And if yes, could you give me the instructions. Sorry if this is something that could be understood by reading a manual, i tried and failed, this matter is a bit complicated to me, i’m a beginner in this world of synths, midi and all that terminology. It seems the obvious resolution of the “problem” is the one you’re already aware of - use an analog volume pedal at the XF’s outputs. You haven’t provided details of how the Master is set up, but I presume that you have the Int Switch turned off for the Zones that you want to play only with the external controller. If you do that, the Control Sliders for those Zones won’t be able to set Volume level. 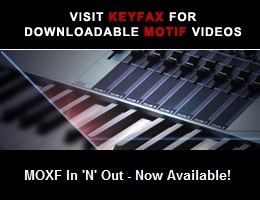 That problem can be avoided by leaving the Int Switch on, but set the Note Limits in the Master so that the XF’s keyboard can’t play the Zones to be externally controlled.